Back in 2010, American Express in an effort to local business and communities, added another special shopping event for shoppers and retailers to enjoy - Small Business Saturday. The celebration of the local small business community (no matter where you are) encourages people to get out and explore your neighborhood shops using tools like this Shop Small Map. The day has encouraged a swell of support for independent shops across America and will likely use that momentum to eventually become an international event. The special relationships we develop with small businesses go beyond the products and services your neighborhood artisans provide. Everyone knows that small businesses make up the backbone of the economy and without them, America would lose a fundamental aspect of its identity. Despite our fondness and loyalty for these SMBs, consumers can’t support all of the hopeful entrepreneurs in the market. Only half of small businesses last 5 years. 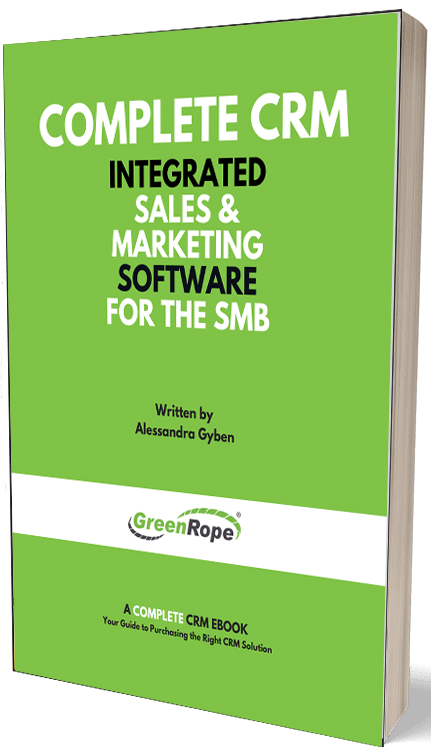 That being said, GreenRope’s mission is to break that statistic, helping all business enjoy streamline growth and profitability. If you are currently managing your own business, the hardships of growth aren’t something I need to explain with statistics. You know the struggle of trying to bring more traffic to your shop and maintain the quality of your service. Every dollar you invest in your business needs to contribute to your growth. Software solutions that connect organizations to new customers and strengthen the relationships with those clients are on the rise. Tools that automate repetitive tasks and manage sales data are becoming common to the point that not taking advantage of them could be the factor that leads to a business’s failure. An analysis of various studies concluded that for every $1 spent on a CRM investment, the average ROI is $5.60. That’s a compelling figure, but to bring it into some context I’m going to explain how investing in a complete CRM can help your sales and marketing teams do more with less by making them more productive, efficient, and collaborative. The summer before I went to college I worked at a startup that was entering into the subscription box market at around the same time this method of shopping was becoming the new ‘thing’. Although the subscription box boom was driving a lot of leads to our site, the emerging competition was affecting the growth of our company, which offered fun and healthy pet products. One of our main marketing efforts involved Spokespets, or celebrity animals, on social media. My job was to reach out to potential Spokespets and court them, as well as track the performance of all of these brand ambassadors. This was my first full-time office job. I spent 40 hours a week messaging the owners of the animals and creating reports tracking the performance of my efforts. We were a startup so relationships with each affiliate was short-lived unless they were able to drive conversions. Looking back, we could have easily doubled our investment in these affiliates if we had a more efficient way of recruiting, managing and analysing their effectiveness. Instead of having all of my data scattered across multiple spreadsheets, I would have been able to keep all of my data consistent and accurate within consolidated CRM records. Collecting and maintaining accurate data became a manual, highly tedious task. For example, if anyone from the marketing team needed information, they were forced to wait until I could pull it up and send it over. If we had had a CRM and marketing automation platform in place, the marketing team could have easily pulled the data they needed, knowing it was accurate, right from within the system in real-time. With a complete CRM at my disposal our entire process could have been streamlined. Our daily tasks, contact reports, and data insights would have been accessible to the team, ultimately producing more effective strategies. In a scenario where we had this database, all issues typically seen when scaling wouldn’t exist. I hope my personal example illustrates how a small business of any kind can boost its potential for growth by investing in a complete CRM. Here’s the bottom line: The amount that my employer was paying me for a week’s work was more than the monthly subscription fee for a CRM that could have accomplished the same things and made our team a productive, data-driven, results-oriented powerhouse.